Mary Evelyn (Sellers) Rollow, 96, of Bentonville, Arkansas passed away Monday, October 29, 2018, in Castle Pines, CO. She was born February 16, 1922, in Pratt, Kansas, the daughter of Mary G. and Claude O. Sellers. She attended St. Mary’s Catholic High School in Oklahoma City, OK and taught tap lessons to the little girls at St. Mary’s Boarding School. She attended Oklahoma City University. 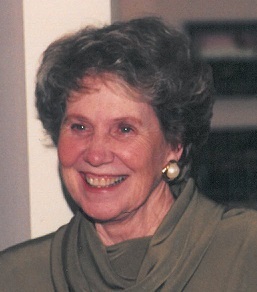 While living in Bentonville, she was president of the PTA, and did extensive volunteer work for the Bates Hospital Foundation and the American Cancer Society. She was always very happy and lighthearted; loved dancing, playing bridge and traveling with family and friends. She was preceded in death by her parents; her husband, John A. Rollow, MD, to whom she was married for 58 years; and one brother, Tom Sellers. She is survived by 3 children; son, John A. Rollow, IV of Silverthorne, CO; two daughters, Linda Seidensticker of Fayetteville, AR and Nancy Stiles of Castle Rock, CO; 6 grandchildren, Sara Beth Kissinger of Rogers, AR, Mary Michael Houghton of Parker, Co, Gabrielle Rollow and Brittney Rollow of Orlando, FL, Katie (Ross) Garces of Denver, CO and Matt Ross of Colorado Springs, CO and seven great grandchildren. Memorial services were held at 3:00PM, December 1, 2018 at Christ’s Episcopal Church in Castle Rock, CO.
Graveside services will be at 3:00PM, Saturday, April 6, 2019 at St. Vincent Cemetery in Rogers, Arkansas. Memorials may be made in memory of Mary Rollow to Suncrest Hospice, 5700 S. Quebec St, Suite 310, Greenwood Village, CO, 80111. Arrangements have been entrusted to Stockdale-Moody Funeral Services in Rogers.